Filey MP Kevin Hollinrake is supporting the town in its efforts to get the prestigious Blue Flag back. The Blue Flag scheme acts as a guarantee to tourists that a beach or marina they are visiting is clean and maintained to the highest standards. The Filey beach water quality is consistently good but needs to be excellent to qualify for a Blue Flag. Filey won the award in 2012 but later lost it because of heavy rainfall which, it was thought, could have polluted the water and affected test results. Mr Hollinrake said: “The monitoring process allows for some sample results to be discounted where adverse results can be directly linked to known events. This is the Pollution Risk Forecasting (PRF). "For some reason, South Bay at Scarborough is included in this process whilst Filey is not. Apparently the Environment Agency has said that the Filey results are not affected by rain, although this is a factor for the South Bay. “I would like the EA to review the way Filey is tested. The sampling results for Filey are in the upper range of good with a few poor results spoiling the overall excellent picture. 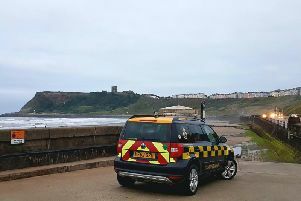 "If Filey were to be included in the EAs Pollution Risk Forecasting (PRF) system it would allow us to discount some results under certain conditions such as when samples are taken after heavy rain. This could get us over the line to excellent water quality."